Through the cooperation of Riverside-Salem UCC/DC, a PEACE EDUCATION FUND (PEF) has been established. Peace education is directed to the full development of the human personality and the strenghtening of respect for human rights and fundamental freedoms; it promotes understanding, tolerance and friendship among all nations and peoples, and among all racial, ethnic and religious groups; it respects all beings, their habitats and their diversity. Donations not designated for Women in Black or the Interfaith Peace Network go into a "General Fund". This fund is used to provide support to individuals, organizations or projects, through an Award / Grant process. Please consider making a donation to the Peace Education fund through the Riverside-Salem UCC donation link below. Thank you to everyone who helped support us in our 2014 funding boost on Indiegogo. Some of the projects we have helped to fund over the years include : PeaceJam; Prisoners Are People, Too; Latin American Solidarity Committee; Tom Potts' dental clinic; Journeys of Solutions (4 Walls Project in El Sauce, Nicaragua); NETO for Healing at the Heart of Niagara; �Reaching Out to Africa� � medical supplies to Sudan; support for travel to Nevada Desert Experience, a Voices for Creative NonViolence walk in Iowa, and to D.C. for environmental witness. 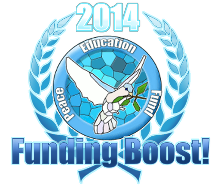 2014 Funding Boost Indiegogo Campaign. Please consider making a direct donation (below) if you would like to help us continue our work. The Peace Education Fund (PEF) is seeking additional members who share our vision and values. We meet (usually) on the third Wednesday of the month in the afternoon. We meet at 1272 Delaware Avenue in Buffalo, and we are especially seeking people who have fund-raising experience and lots of creative ideas.